There&apos;s another confirmed sighting of the emerald ash borer in Wisconsin. Less than a week after the tree-killing beetle was found in Ozaukee County, state officials have identified a second case in neighboring Washington County. DATCP pest specialist Mick Skwarok says three adult beetles were found in a sticky trap set earlier this summer. Test results on Wednesday confirmed the insects were the emerald ash borer. The second site is about a mile away from where the beetle was first found near the village of Newburg. Skwarok says the discovery reinforces a decision to quarantine ash wood in several southeastern Wisconsin counties. Currently, Ozaukee, Washington, Sheboygan and Fond du Lac are all under quarantine because of their proximity to the infestation. Skwarok says efforts are underway to determine how long EAB has been in the state and the size of the infestation. However, it may take some time before the agency can determine if this is the edge of their presence or the core infestation. For now, Skwarok says the most important thing the public can do to prevent the spread of EAB is to stop moving firewood. He says that&apos;s probably the main reason in beetle has been able to spread so far across the country. 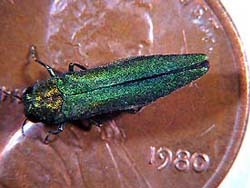 EAB puts over 130 million Wisconsin ash trees at risk.